The Brooklyn Project is focused on the writing, design, and craft of creating complex, realistic, relatable heroes. Named in honor of Steve Rogers’ birthplace, the Brooklyn Project was created in response to a movement against heroes. Heroic realism is the new black–some things don’t come in shades of gray. Disclaimer: I don’t think that all atheists write depressing things. As a Christian, however, I tend to find atheistic beliefs very depressing. I don’t intend to offend; this is simply how I read it. Okay, so first for some background. Dr. Elwin Ransom is the central or viewpoint character in C.S. Lewis’ novels Out of the Silent Planet and Perelandra, and an important character (though no longer a viewpoint character) in That Hideous Strength. He was also featured in the unfinished story The Dark Tower. These novels were written as part of a dare between Lewis and fellow Inkling J.R.R. Tolkien. Lewis was supposed to write a science-fiction story, while Tolkien was going to try a time-travel novel. (Tolkien’s side of the dare is sadly incomplete.) From the three completed books and parts of The Dark Tower, you can gather some important information about the hero’s personal history. He fought in the First World War. I don’t recall where he was in action or if it was even mentioned which unit he was in, but he did see action. He teaches at a university (I don’t remember, but I think it was Cambridge.) I wish he was my teacher. But the truly ironic thing about Ransom is that he’s one of the Lost Generation. The Lost Generation is a term used to refer to the men who fought in the First World War and came home disillusioned, with war, with themselves, and with the values of the previous generation. Lewis, along with F. Scott Fitzgerald and Earnest Hemingway (and Ransom! ), was a member of the Lost Generation and fought in the First World War. While some people lost their way, Lewis is a good example of how bad things can either press people to disillusionment or to hope. The thing about Lewis, however, is that, while he powerfully conveys the agony that is doubt and interior struggle, he is also absolutely brilliant at writing that moment of clarity that ends all doubt and pours new life into the soul. When the reader reaches that moment of resolution, it is a cleansing and rejuvenating experience for him or her as well as for Ransom. Reading C.S. Lewis is like doing spring-cleaning in your head. C.S. Lewis is a whole new level of metafiction. Out of the Silent Planet, Perelandra and That Hideous Strength are essentially metafiction on the Bible. Seriously, do you need any more reasons why you should go and read them?! I never expected this segment of the project to take this long! Oh well. In the first segment, I discussed why anger is important to your writing (you have to include emotion or your characters will come off as unfeeling or sociopathic), and typical ways character types get angry. In the second, I talked about some specific examples. Now that everyone has had their free yogurt facial, I’m going to start talking. As you saw in my last post in this series, characters often act in given ways due to their backstory. This isn’t necessarily part of their personality, though. For the sake of this post, I’m referring to personality as an enduring set of traits that influence a person to act in a certain way. Some characters may go through a lot of trauma and never show any outward sign of it. Others may struggle to come to terms with it, but their core personality remains the same. Others are completely different following the experience. How intense was the experience? How profound an effect did it have on the character? Was it a “first time” of some kind? How old was the character at the time? Also you have to consider the character. Some characters are just more resilient than others. When a character gets angry, consider how they do it. Do they rage? Do they threaten violence? Do they use their words, and how do they use their words? Do they just walk away, or do they confront the problem? Before the monster could shatter Cael’s bones with that massive paw, it suddenly reeled backwards, writhing in agony, a faint blue light shining from somewhere in the area of its maw. Its death throes lasted for only a few seconds, but it seemed much longer. As the beast fell, Arden leaped down from its back. ‘What are you doing here, Cael?’ he asked in a quiet, calculated voice, his face immobile. ‘I thought someone was in trouble,’ Cael stammered. ‘And you just wandered off?’ The words were velvety smooth but as perilous as quicksand. Not trusting himself to answer aloud, Cael nodded. ‘What did I tell you?’ Arden asked, his eyes flashing. Cael wondered if Arden was going to punish him in some way. But rather than doing anything, Arden continued in that dulcet, threatening tone, which was, in a way, more terrifying than anything he might have done. Remember that some characters are just innately more terrifying when they’re angry than others. If your viewpoint character is the object of the anger, make sure to decide whether the other character’s form of anger is frightening to them or not, then pick out a few details that stand out to them. Choose just a couple of reasons why the anger is frightening and focus on them. Scrub your writing of too many details and purple or flowery prose–you can use a few details and a few unusual words, but don’t use too many, which will bog your writing down and detract from the emotion of the scene. The same advice can also be useful for writing other forms of fear and shock as well. You can also, if you like, include some incongruous details for your character to notice: the color of a friend’s eyes, a brightly-colored balloon, a flower, the fact that it’s suddenly clouded over or cleared up. Use them to create a sense of detachment and for contrast. Welcome back to this Brooklyn Project special on Writing Anger! In the previous post, I explained why anger (and other emotions) is important to your novel and the different tendencies of character types in anger. In this post, I will give specific examples, explain how backstory can influence a character’s emotions, and give some advice and handy tools for writing it into your novels. As an adult, Obi-Wan was not as likely to flare up, even when provoked. It took a major provocation (oftentimes aimed at his loved ones rather than himself) to get him angry. While he was outwardly a model of serenity, he was really a visionary, passionate and idealistic, and had an innate ability to read other people and respond to them in a disarming way. (Oh, sorry, did I say Obi-Wan was INTJ? It’s really hard to tell if that big letter is a T or an F, especially with him.) Obi-Wan was both a traditionalist and a reformer, and given enough time he might have been able to get the entire Jedi Order back on track. Obi-Wan always had a sarcastic and often dark sense of humor with a love of wordplay and a cutting wit that he used as a smokescreen to hide any internal trepidation. However, his sarcasm was more often a part of his humor than of his anger. As an adult, Obi-Wan responded to anger in one of two ways. One was a sudden burst of anger (in response to sudden provocation), followed quickly by calm, rational thought, and the other was a cold, distant, controlled and calculated wrath that was completely terrifying, even if you were not the target of it at the time. Obi-Wan was not an angry person, however. His anger was aroused and then when it was over, it was completely gone. The Doctor, while he had a similar upbringing (taught at an academy with little to no familial contact after his induction), was always more of a rebel. While Obi-Wan had an intuitive understanding of the world and the people around him, the Doctor, while brilliant, would often find himself confronted by situations and things he didn’t understand. The Doctor never particularly cared about other people’s opinions and was often more sassy than sarcastic. Sarcasm was not often a part of his anger, either. The Doctor didn’t often have those rapid flare-ups of temper as an adult–his anger was a constant, a perpetual and constantly controlled presence and as such it was always tightly controlled. When openly angry, the Doctor’s anger was similar to Obi-Wan’s calculated cold fury. He would often be verbally cutting (though not sarcastic,) whittling people down (often to tears) with words. His word choice, posture, and expression would all become menacing. 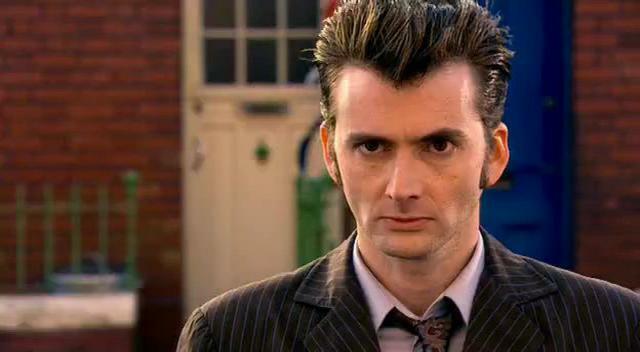 For me, the most effective thing about David Tennant’s performance as the Doctor was the way he could play a character who is sweet, charming, frankly adorable and a little bit ditzy but who is at the same time an intensely driven individual, with an ever-present and deep-rooted anger–especially the way Tennant is able to jump so quickly between the two. There was another image I was going to use, but it’s the most terrifying expression you are ever likely to see, so I’m going to refrain. This blog is mostly G-rated, after all. 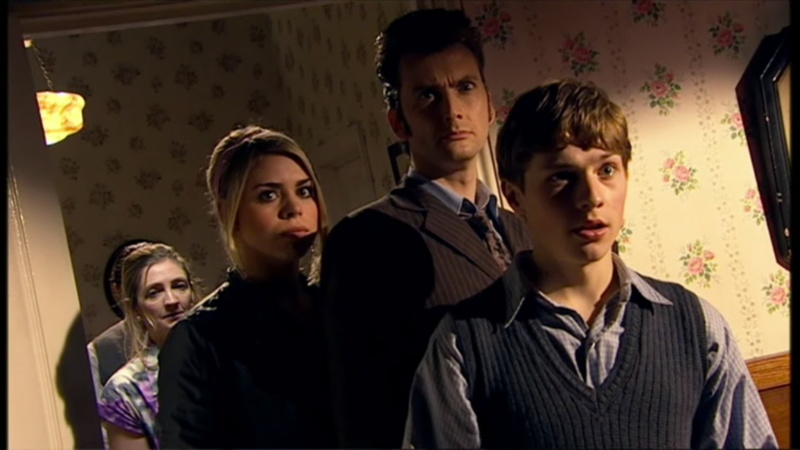 Their angry expressions vary, too: Obi-Wan presses his lips together tightly, the Doctor tends to display his teeth (which is slightly unnerving in its own right–Ten’s teeth are sort of angled-in, which prompted him to comment “That’s weird” immediately after his regeneration.) Obi-Wan’s anger is all in the way he looks calculatedly at people, while the Doctor’s anger is all in the eyes and mouth–eyebrows draw together, lips curl back, and his nose wrinkles a little. The Doctor looms over people, while Obi-Wan tenses up in his core and has to remind himself to breathe. That last one could be more because Obi-Wan’s training was a little more martial in style, so he’s preparing to leap into action at any second. The Doctor’s anger intimidates, while Obi-Wan prepares to fight. Let’s talk about Steve Rogers, a typical Type One. Steve doesn’t get angry often, but when he does, you do not want to get on his bad side. Captain America: The Winter Soldier has several prime examples. In the first fifteen or so minutes of the movie, he tells Fury off for not giving him the whole story about the opening mission. Rather than verbally attacking Fury or using sarcasm, though, he lets Fury know he’s angry and then tells him why in plain language that’s not calculated to make Fury angry in turn. As a result, we find out how much Fury really respects Steve–in response to Steve’s accusation, he shows us that he values Steve’s respect by showing Steve SHIELD’s latest top-secret project: Project Insight. You wouldn’t think that Fury would let something like Steve’s respect be that important to him, but it is. The other notable anger we see Steve display in The Winter Soldier is his anger following the shock of discovering that his best friend is still alive and has been brainwashed into a Soviet superweapon. “Would you have compartmentalized that too?” he asks Fury, the most biting his language to Fury has gotten thus far. He’s being a little bit irrational, which is not really typical for Steve at all. I think that in the scene on the bridge when Sam Wilson says “He’s the kind you stop,” Steve is still angry about it but keeps himself from lashing out viciously at Sam because it is not Sam’s fault. You can’t really see it on his face when Steve is angry because his angry look is more “calculating” than “angry.” You have to listen to him to know he’s angry. Also, Steve’s sarcasm is rarely connected with his anger–it’s more self-deprecating. We generally only see him use sarcasm when he’s angry with himself or trying to work with people, and then he uses his sarcasm the same way–to defuse the situation through self-deprecating humor. It’s very rare for us to see Steve use anything but plain language–which would seem to be a fairly common trait for Type Ones. They can get technical, but most of the time they whittle things down to the barest meaning they can. Bucky Barnes is different from most Type Twos. He’s brave, funny, active, adventurous, and a people person. Cool factor was harder to figure out, but he’s the Winter Soldier. However, he isn’t as much of a planner as Steve is and as a result we never see him planning anything in particular. Rather than acting or taking the initiative, we see him reacting (which is probably because his supposed death is the “Mirror Moment” of The First Avenger–the moment the main character goes from reacting to initiating the action.) Bucky is more of what I’d call a mature Type Two–a Type Two who is aware of their own character flaws and dark side, making it more of a character strength for him than a weakness. He’s less existential than Type Ones or Fives though, so he doesn’t deal with such deep self-hate as, for instance, the Doctor, Obi-Wan, or Steve. Wow. This post turned out long. I’ll have to split it into three, rather than two as I had planned… Stay tuned for the final installment of this series! Yes, I know it has been a while. I’m sorry. Also, I am not going to list all my (completely valid) excuses here because that would be an entire post in itself. And a half. In this post, I will explain the different ways different types of characters get angry and why this is important to your story. In the second part of this post (coming soon,) I will give specific examples and explain how you can use this in your story. Click here for Character Profile #1. Click here for Character Profile #2. Click here for Character Profile #3. Click here for Character Profile #4. Click here for Character Profile #5. Now that that’s out of the way, we can talk character! Anger is always a useful tool to better define characters in your readers’ minds. A character who does not get angry or otherwise show an emotion at some point (preferably multiple some-point’s!) in the course of a story will come off as either an emotionless robot or a soulless, undeveloped, bland nobody. What would xe see as an unforgivable outrage? Is xe more likely to try to control xir anger? Different character types tend to get angry differently. Type Ones can get this look that they are plotting horrible revenge (I am looking at you, Steven Rogers! ), or alternatively get quiet and extremely calculating when they are angry. In fact, they may not seem to be angry at all, but use calculated language to make others angry. Type Twos and Threes often explode in anger or lash out verbally at others because they feel their Fortress of Solitude has been penetrated or wronged. (Incidentally, these two types are also the most likely to take criticism personally rather than realistically and implementing it to improve performance, like Type Ones and Type Fives often do.) Type Twos and Threes are often blissfully unaware of their own character flaws and defects (unlike Type Ones and Fives, who tend to know their own personalities altogether too well and are more likely to develop self-hate as a result), and when their personal flaws are pointed out to them, they get defensive and angry. They’re also more likely to get worked up about things (taking gentle criticism completely out of context, for instance.) Like Type Fives, Type Twos and Type Threes sometimes do things that are considered inappropriate, but because they are in the grip of some powerful passion and they aren’t thinking ahead. Type Fours are most likely to explode in anger when their friends are attacked, whether physically (when Steve Rogers was being beaten up behind the theater, for instance) or verbally (if one character says something bad about another character), especially if the accusation is untrue or perceived to be untrue. They are more likely to lash out with words than physically, and when aroused can be just as verbally cutting as a Type One or a Type Five. Type Ones and Fives are the deep thinkers. Type Ones tend to get angry about social injustice and similar issues, while a Type Five is more likely to go out and do something about it. (However, since Type Fives often tend to be “poorly socialized”, sometimes the things they do about injustice are either blown totally out of proportion or just generally inappropriate, though their solutions are almost never completely ineffective.) Both Type Ones and Type Fives are the most likely to work themselves up about things that may or may not be personal to them, but in a completely impersonal way. Type Fives almost never get angry because of a personal attack. Type Ones may get depressed over being attacked in a personal way, but they don’t retaliate. Type Fives are the most likely of any type to retaliate for any perceived wrongdoing, simply because they perceived it as a wrong and not out of any personal, emotional response. Type Fives always think ahead–in terms of logic, not generally accepted norms–and will reach conclusions and do things that make them appear to others as amoral, weird, or unfeeling. However, those conclusions, to them, make perfect sense, and they often react with surprise or confusion when informed that “People just don’t do that!” Type Fives will also go through with a logical course of action, even if it will have a negative impact on them. They aren’t unware that there will be consequences. They’ve simply weighed benefits against consequences and decided on (to them) an appropriate course of action. As a result, it may seem like Type Fives don’t get angry, but they may simply not be showing that anger on the outside while their movements are calculated and driven by deep, elemental passion. If you have posed a threat, done something to, hurt, or otherwise upset to the friend of a Type Five (even one who, like Batman, won’t kill you,) you are done for. Prepare for your life to be made miserable. The perceived wrong may not have even particularly upset the friend. In the eyes of the Type Five, you are guilty and the logical conclusion is that you deserve to be punished. Here ends Part One of this post. You might also want to check out WriteFury’s post on Myers-Briggs personality types as a characterization tool. For specific examples and more on how backstory drives characters’ emotions, check back in shortly to read Part Two. As always, thanks for reading, have a great day, and God Bless! Yes, Steve Rogers would agree. Because that is Steve Rogers. Truly humble, because he knows all his own failings. He knows, deep down inside, that he is not perfect. He doesn’t try to be perfect. He just tries to be a good man, and sometimes, he finds himself lacking. 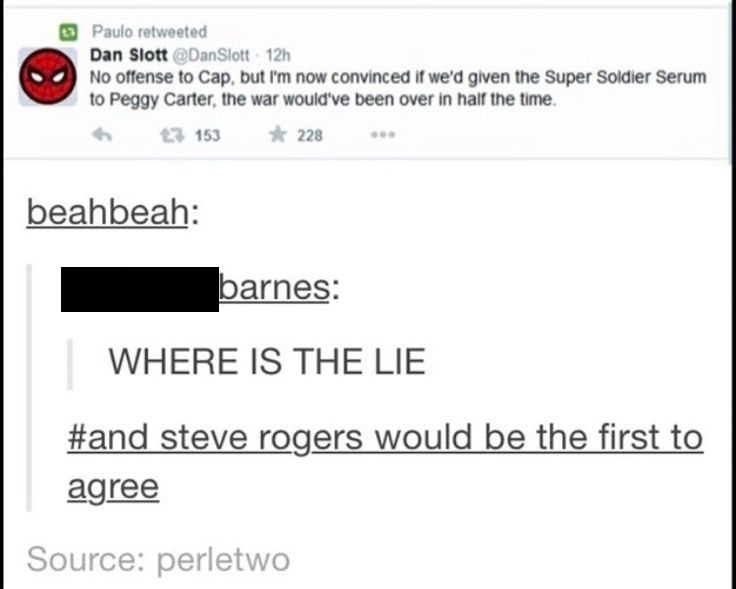 And, I would argue, that is why he’s the super soldier, and not Peggy. Steve Rogers doesn’t go picking fights. He might “ask for it”, but he doesn’t start them. He speaks up, but when he’s not speaking up, he’s not noticed a lot. He’s not self-assured. He tends to question his own motives and actions–which is why Erskine picked him, because he is careful about what he’s contributing to. On the other hand, Peggy can be a bit rash at times, and she’s very self-assured, and while she sometimes questions, she doesn’t second-guess herself nearly as much as Steve does (to be just, I don’t think of them either really needs to second-guess themselves often, because they normally get it right the first time.) Steve doesn’t play up to anyone’s expectations, while Peggy acts up to those expectations so that people will underestimate her quite a bit. Steve is always completely honest and open, and while Peggy admires that, it’s not something that she can be in her line of work. The whole reason that Erskine chose Steve was because Steve was already a hero in a small way. He was just giving Steve the ability to do it on another scale. Also, I feel that when we suggest that Peggy could have ended the war so much sooner if she had been a super soldier, we are devaluing Peggy as she is! She is a strong woman. She’s strong when Steve can’t be. Peggy doesn’t need the super soldier serum to make a change. She takes charge and steps in and doesn’t let them keep her out, and she’s way more successful at it than Steve. In so many ways, while Steve is the hero the world looks to, Peggy is the hero Steve looks to. Peggy is smarter about her emotions than he is. He gets lost; she puts him back on track. In short, Peggy doesn’t need the serum. In a similar way that Steve Rogers doesn’t need the serum, true, except he isn’t as strong as she is, emotionally or possibly even physically. She’s just better at going far than he is, and that’s why he is the supersoldier and she is not–because he’s humble and will back out when they’re done with the fight, while she will go on to build SHIELD. Oftentimes, you’ll come across a character who is, to quote Chris Evans, “not a funny guy.” At the same time, they clearly do have a sense of humor. And if you’re in an action story, most of the humor won’t be jokes, of the verbal or practical variety. Nine times out of ten, in an action/adventure flick, your hero won’t be the kind to tell or play jokes. Aside from a wry quip, you won’t hear anything “funny” from them. Humor is a vital tool, not only in keeping a story from getting too dark and intense, but also as a coping mechanism for the characters. Every story needs humor. Basically, it’s poking fun at a situation. It’s a coping tool. I don’t think it will get a lot of laughs, but that’s Connor for you. His sense of humor is a little off-target. Nine times out of ten, an action hero won’t crack a joke. He will quip, however. His humor depends on the situation; his humor is really about telling the universe that he doesn’t care what sort of nonsense it drops on his head, he’ll deal with it and own it. Horatio Hornblower is well-known for this. I can’t think of one particular example at the moment, but a wry aside is something that just happens from time to time. Also, if Indiana Jones does differently, please do not notify me. I’d rather not get any spoilers before I’ve seen the movie. Oh, and late Happy Star Wars day. May the Force be with you–you’re gonna need it. Continuing from the last Brooklyn Project post. Last time, I posted on heroism, the basic elements that all heroes must share, or come to share. Today, I’m posting on the unknown heroes, heroism that isn’t accepted. It’s a not-often-realized truth that for every hero, there is someone who believes in him. However, in real life, many heroes never get more than just that someone. And even that someone may not know the truth of all that they’ve done; they simply believe. It’s like praying in your closet and giving in secret; it does good, regardless or not if anyone knows that you did it. Indeed, to do good without anyone ever knowing is perhaps the very greatest thing of all. I think the Lord of the Rings, while Frodo and Sam and the rest did have their actions recognized, was pretty good at this. Neither Frodo nor Sam ever really did expect to have their actions memorialized like they were. The thoughts they had of being in a story were more distant, held to keep their spirits up. Aragorn speaks to Eowyn of the unstoried heroes who they all may become, ultimately, should the threat of Sauron come to completion. Boromir was motivated in part by the glory of his home country, but in the end, he gave his life for two hobbits whom he had met mere months before, far from his home, before the larger war even began. The heroes of The Lord of the Rings acted not in the interest of glory, but because what they did had to be done; even if their world was to be enslaved, they’d die trying to stop Sauron from enslaving it. Heroism is a curious thing. While it is somewhat based on the opinions of others, true heroism is the heroism that nobody ever sees. How annoying is someone who spouts preachy nonsense without following it in real life? … yeah, that’s what I thought you’d all say. ;-P This is another reason why protagonist-centered morality deserves to be ditched; it creates a double standard. Otherwise known as you-just-made-your-hero/anti-hero-a-hypocrite. And somewhere in the world, there is a reader who will call you on it. There are multiple readers who will hate on your hard-written book because of it. Simply put, even if your heroes (well, only anti-heroes do this; real, actual heroes don’t,) don’t hold themselves to the standards they hold others to, you should. Actions have consequences (I’m certain you’ve heard this before in much less polite terms.) Don’t forget that, and don’t let your heroes forget it, either. Even if they don’t hold themselves to the standard, it falls to you to hold them to it. Protagonist-centered morality and double standards make Mary Sues. À bas les Sues!